Originally published under the title "The Links between Madrassas and Terror." For years Islamists have argued that there is no evidence private Islamic schools – madrassas – are churning out radical jihadis willing to lay down their lives for Islam, fighting the supposed "kaafirs" (Christians, Jews, Hindus, atheists). Despite the fact that most of the Taliban, Boko Haram, al-Shabab and al-Qaida jihadis came from such institutions, Canadian Islamists and most of the media have dismissed my warnings and those of others on this issue as "fear mongering" and "Islamophobia." But now, Pakistani jihadi Tashfeen Malik, a student of a madrassa, has helped to carry out the San Bernardino massacre. For two years, Malik attended the world's leading female Muslim madrassa, the Al-Huda Institute In Multan, Pakistan, which has a Canadian branch in Mississauga. 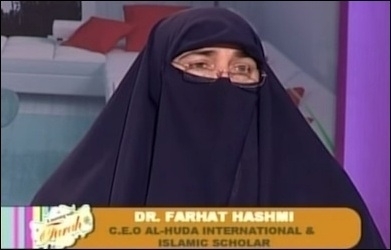 The founder of this international network of Islamist schools is Dr. Farhat Hashmi. Who is she? I've only met her once. But I have childhood friends who say they have lost their wives and, at times, daughters and sisters to what they describe as a form of brainwashing that turns Muslim women from educated, working, liberal mothers into stay-at-home moms, who celebrate misogyny as Islamic women's lib. One friend, a wealthy businessman, ended up losing a considerable part of his family's wealth after his wife donated millions to the school's worldwide network. Farhat Hashmi, founder of the world's leading female Muslim madrassa. Dr. Hashmi has said Malik did not understand the peaceful message of Islam, that her school abhors violence, and that it cannot be held responsible for the personal acts of one student. But she has been a controversial figure in Canada as well as around the world. Dr. Hashmi preaches a conservative version of Islam as it applies to women, including how to segregate themselves from infidels by wearing burkas, not working outside their homes, and being subservient to their husbands. She has also been accused of supporting polygamy, which she denies. 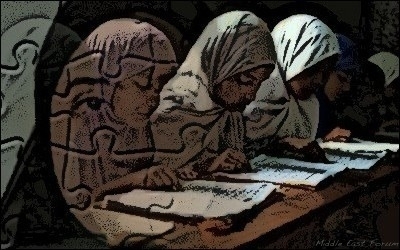 Most of her students do not exhibit Islamic militancy and the school has never been connected to any known terrorist group. But even those who turn to Islamic orthodoxy, rather than militancy, can be a cause for concern. In October, 2005, the academy-award winning Pakistani filmmaker Sharmeen Obaid-Chinoy was able to spend a day inside her Islamic school. Writing for the Globe and Mail, she recorded the words of one Muslim teen who defended polygamy, arguing that Western society accords less respect to women, allowing men to have affairs without taking any responsibility. "There are more women than men in this world", the student noted. "Who will take care of these women? It is better for a man to do things legally by taking a second wife, rather than having an affair." Small wonder Republican presidential contender Donald Trump keeps getting more popular as he denigrates Muslims and calls for them to be banned from the United States, even while his political opponents hurl epithets at him.